See my review of LEVIATHAN WAKES, book one in this series! I listened to the audio of this one - just like I did for LEVIATHAN WAKES - so I liked how it was paced for that. I thought it was a good Science Fiction book and I am definitely going to continue the series, but I did have a couple issues with it. However, having some Grade A female, main characters was AH-MAZING. And I loved the way that the plot is all starting to fit together, especially at the end. If you're looking for a good, fast-paced, action-heavy Science Fiction book (and series! ), this is the one for you! I like the characters so much. Like, so much. I love that everyone has agency and that they make choices with actual consequences. I like that it's not just easy because they are the main characters. Which was especially true in this one and made my heart really happy. I would have liked a bit more from Bobbie than what we got but hopefully that is coming in the next one! I just had so much fun getting back into these characters and their world in this one. However, I was kinda disappointed with how the plot started? I thought that LEVIATHAN WAKES was a great novel - and could probably have been a standalone one. Yes, there were some unanswered questions and room to explore other outlets in the world. But there was some resolution. And I think that plays into how CALIBAN'S WAR starts - and why it lags a little. The first 25% of the book felt like the first 25% of a first book in a series, not a second. So it threw me off a little when I was listening. Like, yeah, you had to have read LEVIATHAN WAKES to understand what is happening in this novel, but I felt like it took a little too long to get to the point of this one. It started off strong and then dragged a little, then picked up again. I think the next book will start off a lot faster paced - and stay that way - so I am looking forward to queueing it up on my audible! 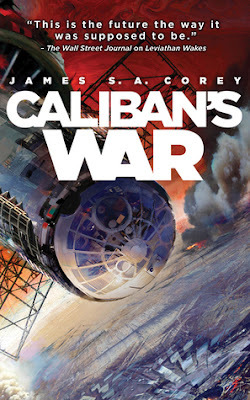 Again, this is a great Science Fiction novel and if you like space, action sequences, and badass females, you will like The Expanse series!